You have taken the most important critical first step….An interest in the subject of finding peace. First and foremost, be proud of yourself for taking a step towards your own lasting happiness. Everyone is interested in finding peace, sometimes we just don’t know how to go about it. Everyone wants to feel love, everyone wants to be happy and everyone wants to feel a sense of peace. So why don’t people experience this? Well how many people do you know have these listed as their top goals in life. Oh sure, I think everyone would agree they want these things, but how many people are willing to put the effort into actually learning how to get there? We often want an end result but don’t realize we must put effort into something that seems unrelated. As an example, I once bought my Mother an IPad so she could communicate with her family, send and receive texts, see photos of her grandchildren, surf the internet, etc.. Guess what? After about six months I gave up. She certainly had an interest in being more in touch with her family. She did not however have enough of an interest to learn how to utilize technology to get there. It is the same way with discovering happiness and finding peace. Sometimes people just don’t want to do the work of seeking higher levels of consciousness because it seems unrelated; even though this leads to happiness. Sometimes people just don’t want to change, and hey that’s ok, everyone can choose to live with suffering for as long as they want. It is not something to be looked down upon. But you are here because you sense there might be another way to experience life. This small amount of faith in believing in another way is all that’s needed. This is your will and desire being activated towards an end result. Sometimes people just don’t know what they don’t know, this is the basic definition of ignorance. Everyone will experience what they seek in life. The biggest question is to know and understand what you are seeking. Where does real happiness and peace come from? Finding peace and happiness is a state of mind. It cannot be found outside ourselves. Finding peace is a natural by-product of experiencing higher levels of consciousness. It is a state achieved when the ego is subdued and one gets in touch with the soul aspect of themselves. It is about letting go of attachments. These are attachments to things, people, judgments, strong opinions and mostly our own thoughts. It is about letting go of some ideal image of who we must be to please others. To be at peace means to accept, “everything is at it should be.” This can be very difficult because we are brought up to believe things have to be a certain way in order for us to be happy. 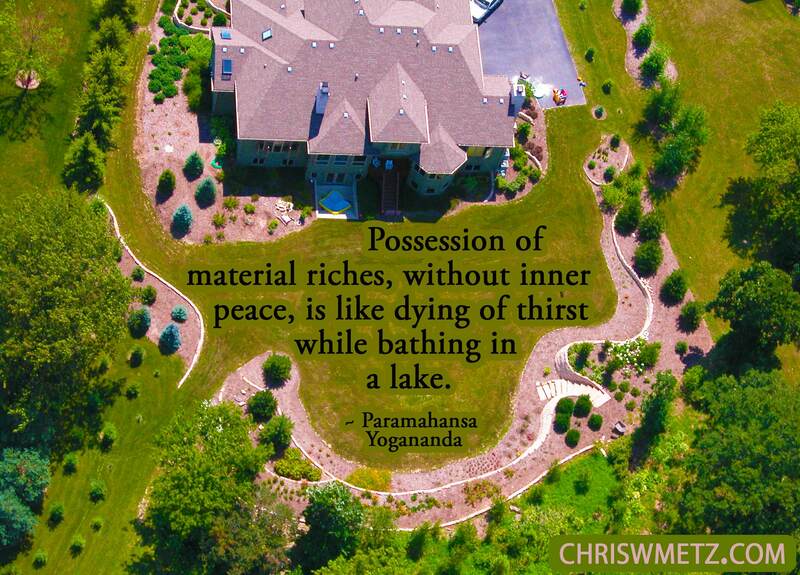 When we give up this notion, we can then just sit in our own paradise of happiness. I truly want to help you achieve these things but you must want it more than anyone. This is the only way we learn anything in life, we must have a desire to learn. We must have some faith in the process and we must place some amount of trust in a teacher/mentor/coach or guide. If you want it bad enough you can rely on yourself as your own teacher but you must still rely on some type of guidance to get you there. Not sure where to start? Let’s start with a basic understanding about knowledge and beliefs. Until a new belief or new knowledge is absorbed and brought into our truth, all the old beliefs and knowledge will remain the same. 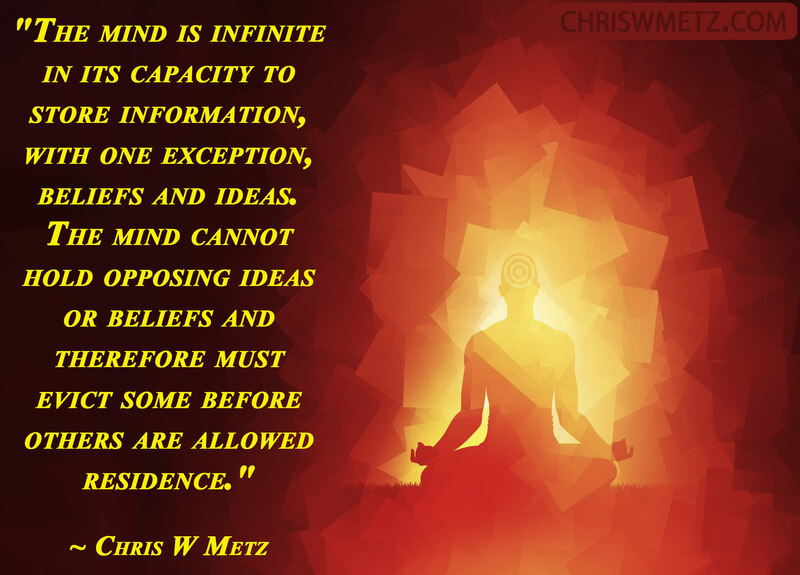 By keeping all the same beliefs and knowledge we remain static and growth is not possible. AWARENESS IS KEY! Without your own awareness you are doomed to the programmed responses of your learned behaviors and reactions. In eastern culture there is a long standing tradition of the “Master/Disciple” relationship or the “Teacher/Student” relationship. In these relationships the “student or disciple” submits themselves to the wisdom of the “master or teacher” in order to learn. Learning can take place rapidly when a student is willing to forego their ego and place their faith in the master’s teaching. The student becomes a sponge soaking up the wisdom of the master. In the western culture of ego driven materialism this type of relationship is rare. I am not suggesting you choose a particular “master or teacher.” What I am suggesting is that you become a willing/ready student. We do this by letting go of our preconceived notions of everything we have learned and everything we believe. We must allow other ideas of thought to gain a foothold in our thinking. This can not possibly happen when we are “attached” to our current beliefs and ideas. This can be a very scary process because our sense of self is grounded in all these beliefs. If we wish to experience the world and life as a joyous and happy experience, then we must change. It is not the world that suddenly changes making us happy, it is our mind that changes. We have no control over the world, we only have control over ourselves. The process of change requires that we ourselves change in order to see the world differently. This is the only way to have a different experience of life. Have you ever read something during your life and never gave it much meaning or thought? Then later in life you read it again and suddenly it took on a whole new meaning or its truth suddenly became clear to you? This is what happens when we become a ready student. This also occurs because we ourselves have reached the level of consciousness at which it can be understood. Everything is written at a certain level of consciousness and our comprehension of the material depends on our own level of consciousness. We must become an empty vessel ready to hold the wisdom and knowledge of those who teach love, compassion, gratitude and peace. We will come to witness their happiness and peace in their life or teachings. Only one thing is needed to start the process…a genuine sincere desire. If we have that, we have the basis for finding what we seek. I have to emphasize this one principle, because with sincere desire and intention something magical begins to happen. The teachers will begin to appear through synchronicity. You will be lead to the right book, the right website, the right people as you are ready for them. Trust me when I say your soul/the universe/spirit will become your guide. You just need to supply sincere desire. I’m sure most everyone at this point is familiar with the movie “The Secret.” (If you haven’t seen it, I suggest you do. It is a great sugar coated primer to the “Law of Attraction.”) The main point is through our own will, thoughts and beliefs we create our life. Anything we desire with strong will and intention will be given to us. There are guidelines and there are certain rules that must be followed but you can create anything you desire. I will go more into these “rules” and “guidelines” in future writings. 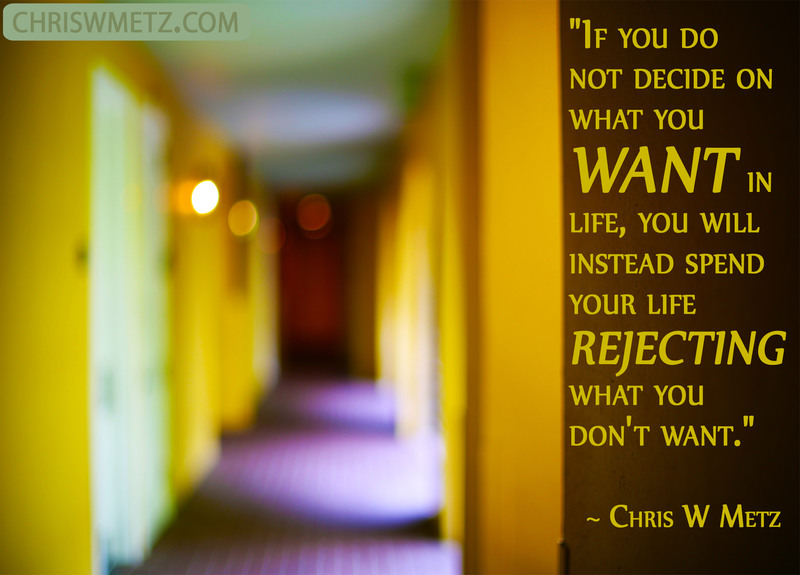 Once you have a sincere desire, I can help you change your thinking and your belief systems. Without these changes, you yourself will never change. If you yourself never change, then your experience of life will never change. This is simple to say, but very difficult for many to understand and apply during life. Anything you want in life can be achieved with strong will, desire and intention. Finding peace and happiness comes from within, it will never be found outside yourself. I can help you to understand consciousness. I can help you raise your own consciousness by looking at life in a new context. I can help you by giving you examples and by using analogies and metaphors. I can help you understand what you are, where you came from and your purpose for being. This is facilitated by helping you understand your soul. Life itself is just one experience of many in the process towards our own perfection. I can help you to understand the ego which is the biggest cause of all suffering and the biggest deterrent to finding peace. We must subdue the ego to experience the immense love that surrounds us always. I can help you overcome the ego by seeing it in a different light. There is a process to growth which requires stepping outside our comfort zone. Overcoming fear or at least having the courage to confront your fears is critical. Part of overcoming fear is a willingness to look at ourselves objectively and this can be scary. We might be afraid of what we find. Growth occurs from learning about ourselves. It is about pushing ourselves beyond our own comfort zone. Eventually you will learn fear itself is a belief. Finding peace is a process that involves many things. A great number of people utilize meditation to quiet the mind and certainly one can get there using this one practice. 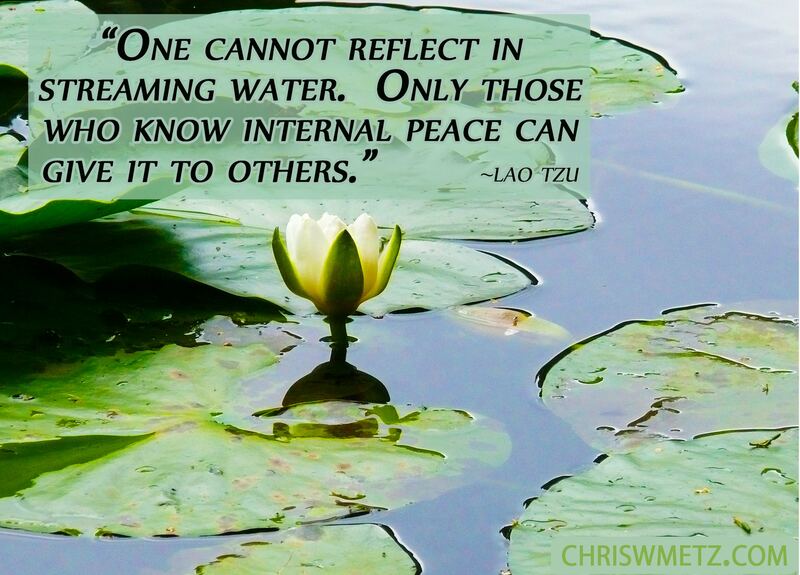 This however can take many years and many hours of practice to achieve this higher awareness. I believe there are many techniques that can be utilized together. When it is all boiled down to a basic principle it involves achieving higher levels of awareness and consciousness. If you are ready to go on this adventure of finding peace, happiness and higher states of awareness, then let’s start by reviewing consciousness.